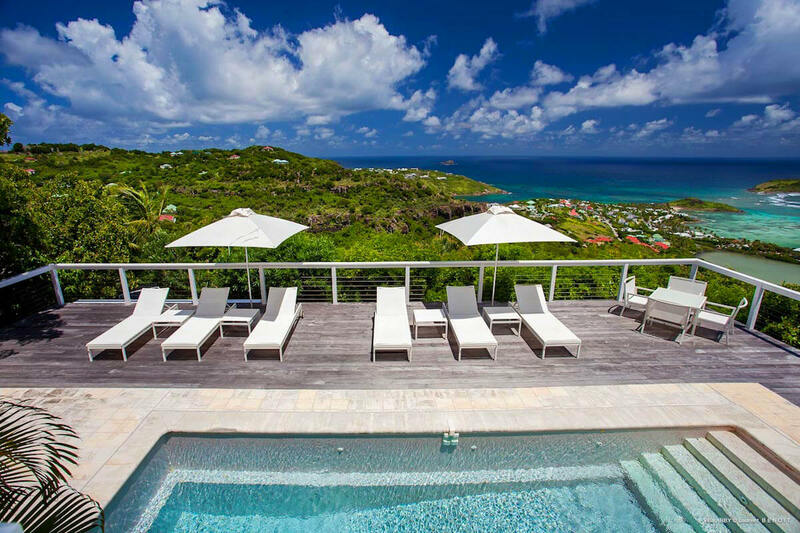 Abby Villa is the perfect St. Barts getaway for three couples who want a cozy, peaceful location near multiple beaches. This hillside beauty has chic, white interiors, top-notch appliances, and lots of outdoor space. Abby Villa is a chic, hilltop villa in Vitet with far-reaching views of the sea and nearby islands. The property is surrounded by lush vegetation and has an open design. A wooden deck and stone patio with loungers and umbrellas surround the villa’s pool, and a small dining table sits off to the side. The pool and deck are lit at night, so guests can relax outside until the stars come out. The wraparound porch leads to the dining gazebo, which has a table for eight, ocean views, and access to the living room. The living room also faces the view and has high ceilings that usher in the tropical breeze. A flatscreen TV comes with an entertainment system, and the adjacent kitchen is equipped with all-white cabinetry and stainless steel built-in appliances. Each of the three bedrooms has an all-white interior, king bed, ensuite bathroom, air-conditioning, and exterior access. The master bedroom connects to an office and is located off the kitchen. The other two bedrooms are next to the living room. WiFi runs throughout the interior, and daily housekeeping maintains the villa. Abby Villa is near three beaches, but well-protected in its largely residential location. Guests can access Petit Cul de Sac, Marigot, and Grand Cul de Sac in a short drive down the hill. Welcome 5 years and older, please.